Howard Stein Hudson (HSH), a firm delivering engineering and transportation planning solutions for clients in Boston and throughout the region, has been selected by the Boston Chapter of Advancing Women in Transportation (WTS) as the 2016 Employer of the Year. The firm was founded in 1987 by Jane Howard and Kathy Stein, colleagues from their work together at the City of Boston. They crafted HSH’s core mission – to create the best solutions for complex challenges in all transportation modes. From its inception, HSH has valued the enthusiasm and drive of young female engineers, allowing them the resources and tools to enhance their career while promoting and advocating for a healthy work/life balance. HSH is now a multidisciplinary engineering and planning firm with offices in Boston and Chelmsford, MA. Currently, 42 percent of its 60 professionals are women. They provide civil engineering, transportation planning, traffic engineering, and public involvement services to public and private clients. 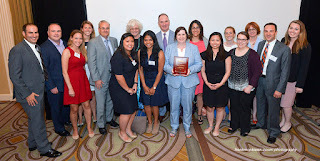 HSH was selected for the 2016 Employer of the Year award based on their commitment to attracting, retaining, and supporting a diverse workforce including nine women in leadership roles such as WTS member Keri Pyke, P.E., PTOE, principal of planning and public involvement; Katie Enright P.E., associate, project manager, senior civil engineer, manager of Chelmsford office; WTS member Bridget Myers, P.E., associate, project manager, senior civil engineer; and WTS member and Professional Development Co-Chair, Jackie Carver, project manager, transportation engineer. HSH supports all staff to continue education with professional education, tuition reimbursement, and involvement in professional organizations. Employees are encouraged to volunteer in the community and are given eight hours of volunteer time off each year. The company also encourages women students to enter the transportation field by providing internship opportunities. The Boston Chapter of WTS was formed in 1980 by a group of 20 women working in the transportation industry. Recognizing the need for women to communicate and establish networks to gain respect within the field, they established the Greater Boston Women's Transportation Group. Their goals included creating a presence, meeting with other women professionals, networking for jobs, holding workshops, giving mutual support, and exchanging information. For more information, visit www.hshassoc.com. For the first time in its history, two women will serve in the American Society of Civil Engineers’ (ASCE) highest leadership roles. ASCE members have elected Kristina Swallow, P.E., ENV SP, F.ASCE, as the society’s newest president-elect. She is the fourth woman to serve in this prestigious office, serving alongside current ASCE president Norma Jean Mattei, Ph.D., P.E., F.ASCE. “Kristina is a dedicated civil engineer and an ardent public policy advocate who possesses a wide breadth of expertise,” says Mattei. “As president-elect, she will bring enthusiasm and passion to the position and a clear focus of what is needed to make ASCE the best it can be.” An active member of ASCE for more than two decades, Swallow is a program manager for the city of Las Vegas, leading a team of engineers responsible for delivering public works projects and planning the sanitary sewer collection system. In addition to her role as ASCE president-elect, Swallow serves as the first board-appointed governor of ASCE’s new Utility Engineering and Surveying Institute and is a member of the society’s Transportation Policy Committee, which develops and maintains ASCE’s official public policies related to transportation. Among many past roles, she served ASCE’s Region 8, which represents members from Hawaii, Alaska, Washington, Oregon, Nevada, Montana, Idaho, Utah, and Arizona, most recently as director from 2012-2015 and as governor from 2005-2008. She served as president of ASCE’s Southern Nevada Younger Member Forum, Las Vegas Branch, and Nevada Section and chaired the Nevada State Infrastructure Report Card Committee. In 2009-2010, Swallow was an ASCE Congressional Fellow, working in the office of Sen. Tom Udall (D-NM), for whom she went on to become legislative assistant managing transportation policy. She earned the ASCE Edmund Friedman Young Engineer Award for Professional Achievement in 2008, the ASCE Young Engineer of the Year Award for the Western Region in 2000, and the ASCE Young Engineer of the Year for Southern Nevada in 1998. The officers elected were installed during ASCE’s Annual Convention, September 28-October 1, in Portland, Oregon. When Bridge Development of Chicago, IL planned to build an advanced, state-of-the-art, convertible refrigerated/freezer building near Seattle's Sea-Tac Airport, they turned to refrigerated facility construction specialists Tippmann Innovation (TI). 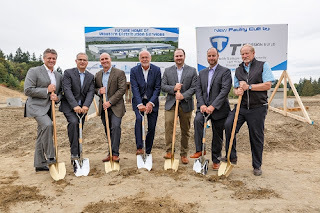 Ground breaking on the ambitious 241,140 square-foot building took place in August at the facility's location in Burien, Washington. Western Distribution Services (WDS) of Renton, WA will operate the facility. "We leveraged Tippmann Innovation's distinctive knowledge base in developing this building. They helped us with all the design details optimized for the scale of what we wanted. Their experience with cold storage is beyond that of a regular contractor. They are a high-touch company that facilitates every aspect of a project," says Steve Poulos, president of Bridge Development. WDS searched for four years, finally securing the 14-acre site to accommodate the scale of the facility they planned to build. The building is unique on multiple levels and presents several design and engineering challenges. WDS wanted a versatile building that is fully convertible and can be used as a freezer or cooler. The building will be able to manage a range of temperatures, from 40 degrees F to -10 degrees F, accommodating everything from meat and produce to frozen foods. "We're honored to have the opportunity to help companies like Bridge Development and Western Distribution Services meet their unique challenges. Every project is different; there is no standard playbook or template that can be used to develop cold storage buildings. We like to feel that each project builds on the last and helps us push the envelope of what's possible just a little further," says Rob Adams, Principal, Tippmann Innovation. "This is a high-profile, precedent-setting project. The building will become an anchor for Burien and the greater Seattle market, and it marks a big step in growing the food business and jobs in this part of Washington," says John Naylor of Western Distribution. Tippmann Innovation is a specialty commercial and industrial cold storage contractor that develops buildings around a business plan, ensuring that an investment becomes a profit center. TI uses time-honed expertise and advanced technology solutions to create efficient buildings that scale with a business and are designed to maximize profitability through fully integrating operations and supply chain. TI provides a full suite of cold storage construction services, including quick freeze, blast freezing, master site planning, and operations and maintenance guidance. TI's innovations include the patented QuickFreeze in-rack freezing system for blast freezing, QuickTemper in-rack tempering system, and T2 spacer system. TI has offices in Indiana, Illinois and Florida and operates internationally. For more information, visit www.ticold.com. AECOM, an integrated global engineering and infrastructure firm, has announced a commitment to reduce greenhouse gas (GHG) emissions by 20 percent, normalized by revenue, across its global operations by 2020, starting from a baseline year in 2015. To achieve this goal, the company will focus on its largest sources of emissions: fleet vehicle fuel, purchased electricity, and heating/cooling for offices. The established target follows AECOM's commitment along with other industry leaders at a White House roundtable in 2015 to collectively reduce GHG emissions by 5 million metric tons between 2008 and 2020. The transition to less-carbon intensive operations is consistent with the company's commitment to transform communities, improve lives, and build a better world. "Our company is built around the power of connected expertise and collaboration to reimagine and create new potential for built and natural environments," says Michael Burke, AECOM's chairman and chief executive officer. "Together, we strive to make a lasting and positive impact on society and the environment that will make a difference for future generations." Golden 1 Center in Sacramento, CA, which aims to be the world's most sustainable arena by achieving a net-zero energy goal through using solar energy for 100 percent of its electricity, saving 700,000 gallons (2.6 million liters) of water annually. Gateway WA, a highway and interchange upgrade project in Perth, Australia, the first road project in the country to earn an excellent rating from the Infrastructure Sustainability Council of Australia for its achievement of being designed, delivered, and operated in a socially and environmentally responsible manner. The Kuala Lumpur Centre for Sustainable Innovation is a joint venture between AECOM and the Malaysian government that focuses on public and private sector engagement to develop innovative and sustainable solutions for improving the city's livability. "This target helps AECOM measure our progress managing our carbon footprint. Together with other leading companies, we recognize the business opportunity connected with this global effort," says Josh Sawislak, AECOM's global director of resilience. "This is more than just being a good corporate citizen. It's smart business to reduce our costs and position us for a sustainable future environmentally and financially." AECOM designs, builds, finances, and operates infrastructure assets for governments, businesses, and organizations in more than 150 countries. For more information, visit www.aecom.com or @AECOM.